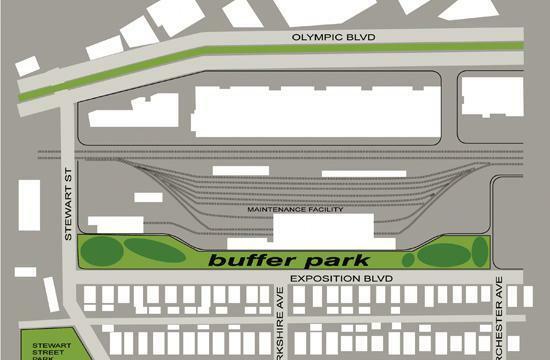 Santa Monica City Council on Tuesday awarded a $6.3 million construction contract to USS Cal Builders to build Buffer Park as part of the Expo Line project. The name “Buffer Park” is a work in progress and a new, more permanent moniker will likely be in play by the time the open space is operational. Once built, the new 2.35-acre park would exist facing a residential neighborhood along Exposition Boulevard at Stewart Street and adjacent to the new Expo Maintenance Facility. The construction contract approval comes after more than three years of planning. On Sept. 11, 2012, Council approved a design contract with Mia Lehrer +Associates to provide design and preconstruction services for the Expo Buffer Park Project along Exposition Boulevard, adjacent to the new Expo Maintenance Facility. Following two and a half years of design, the City issued a Request for Qualifications to building contractors on April 23, 2015. A total of nine qualifications packages were received for construction services. After a staff review of qualifications a short list of three firms were selected to provide bids. A Request for Bids was issued on Aug. 6, 2015 and three bids were received on Sept. 14, 2015. City staff from Public Works recommended USS Cal Builders as the best bidder for the construction of the Expo Buffer Park Project in an amount not to exceed $6,312,856. Staff reviewed the qualifications and rated the submissions based on selection criteria including price, direct experience on similar projects, record performing public sector work, understanding of the project’s scope, approach to the work, qualifications of proposed staff, and scheduling of project activities. Following a thorough review process that included interviews with two of the three bidding teams (the other was W. E. O’Neil – $6,033,886 bid), it was determined that USS Cal Builders was the most qualified firm and best bidder, based on their clear understanding of the project, track record of projects of a similar size and scope, price, and excellent references. USS Cal Builders’ recently completed projects include portions of the Orange County Great Park as well as the Encinitas Community Park. References were contacted and respondents reported that the contractor performed well on their projects. The California Contractors State License Board verified that contractor’s license is current and in good standing. The lowest bidder (Icon West Inc. – $5,692,880) was not selected because their understanding, past professional experience, and plan for building in sensitive residential neighborhoods was not as extensive or strategic as the approach articulated by USS Cal Builders. Additionally, the lowest bidder’s previous construction experience did not reflect a similar size, scope or complexity of park construction that is reflective of the Expo Buffer Park project. The lowest bidder submitted an initial letter of protest, but has chosen not to protest the determination any further. Staff will return to Council in early 2016 with a park name recommendation in accordance with the City’s public land and buildings naming guidelines.